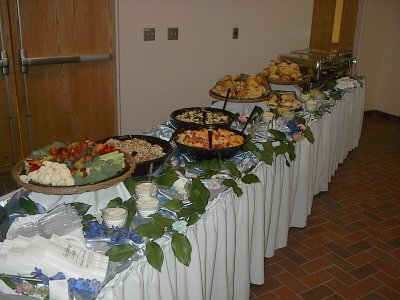 Fast Luncheon menus, Cutting Edge Catering, Catering to your every Whim! Serving Joilet and the entire Chicagoland area! Seasoned Pork Chop stuffed with Homemade Sage Dressing with Gravy. Homemade Sage Dressing rolled with Turkey Breast with Gravy. Whipped Potatoes Rolled with Roast Sirloin of Beef with Mushroom Bordelaise Sauce. 2 Piece Herb Roasted Chicken with Seasoned Potato Wedges. Homemade Meat Loaf with Tomato or Brown Gravy with Red Skin Garlic Mashed Potatoes or Butter Whipped Potatoes. Sliced Beef Steak with Cherry Tomatoes, Red & Green Pepper in a Rich Tomato Beef Gravy & Served with Steamed White Rice. Seasoned Ground Beef with Rice stuffed in a Green Pepper with Tomato Sauce. Menus Include Standard Place Settings (9" Plate, Fork, Knife & Paper Napkin). GO GREEN: 10" Compostable Place Setting for 20¢. All prices are per person based.